Nicholas A. Rowland, 18, of Swanton, OH, died March 19, 2019. He was born May 25, 2000 and adopted from Kamchatka, Russia in December 2001. 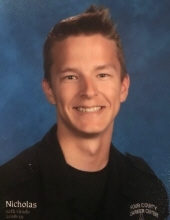 Nicholas was a Senior at Liberty Center High School and attended Four County Career Center majoring in their Law Enforcement program. He recently received regional recognition at Skills USA and was set to compete at state. Nicholas played the trumpet and was a 5-year Marching Band member at LC. He enjoyed playing football and baseball. He loved the Green Bay Packers, everything Ohio State and the color orange. Nicholas was working as a Clicklist team member at Kroger in Waterville. He was planning to attend Northwest State Community College in the fall. Survivors include his mother, Martie Rowland, sister, Nadia Rowland, aunts, Brenda DeHart and Lisa Grandowicz, and uncle, Jim (Sharon) Grandowicz. He was preceded in death by his father, Earl Rowland, Jr., grandparents, Virginia Ashcraft Rowland and Sylvester Grandowicz and uncles, Gary DeHart and Denny Grandowicz. To send flowers or a remembrance gift to the family of Nicholas Alexander Rowland, please visit our Tribute Store. "Email Address" would like to share the life celebration of Nicholas Alexander Rowland. Click on the "link" to go to share a favorite memory or leave a condolence message for the family.